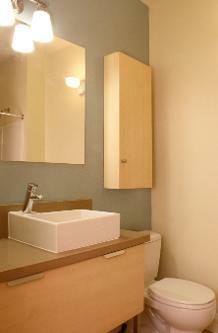 This apartment is located in a densely populated city overlooking a greenbelt. The building turned 100 years old and the basement apartment needed structural and loving care. The design reflects the building's history while creating the feeling of a modern sophisticated get-away. Construction includes recycled materials, energy efficient appliances and fixtures, heat pump with individual room controls, and energy up-grades exceed the current energy code. Door hardware and light fixtures from Earthwise Building Salvage. 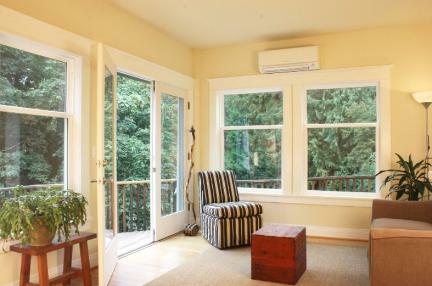 Ductless heat pump was installed with individual room controls. 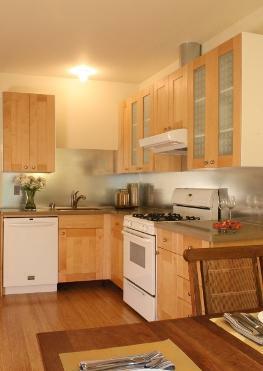 Kitchen cabinets repurposed, solid surface counters and galvanized steel backsplash.